It’s no secret that dorm rooms and prison cells have a lot in common. Small, usually shared space with the barest minimum of storage and precisely no style easily describes both environments. 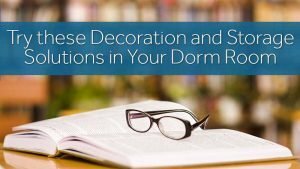 The difference, however, is that the occupants of dorm rooms can arrive with supplies in hand and, within limits, decorate their tiny spaces to their hearts’ content. Whew! Because honestly, who wants to feel like a prisoner in their dorm room? The first year in a dorm provides the adventure of learning how to make do in such a small area. You’ll learn much and accrue the know-how to economize in close quarters for the ensuing school years. Here are a few tips to try your first year out to see what works well for you. Postage stamps will mock your horizontal square footage. Ok, that might be an exaggeration, but let’s face it, space is hard to come by in a dorm. So you’ll have little other choice than to go vertical with your storage systems. Floor space not consumed by furniture must remain clear for accessing those things that are just slightly out of reach, like the door. 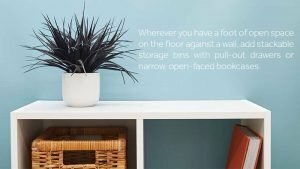 But wherever you have a foot of open space on the floor against a wall, add stackable storage bins with pull-out drawers or narrow, open-faced bookcases. Anything that can possibly be hung on the walls or doors using over-the-door holders, or any of the many removable adhesive-held hooks should find homes on the walls in convenient locations around the room. When living in a veritable broom closet, you quickly learn that everything should have a solid, flat surface upon which to put more stuff. Storage ottomans are great for stashing your purses or shoes while providing an extra place to sit or stack books. Avoid the “pouf” style soft seating cubes because they’re lazy and accomplish only one thing. Make your stuff multi-task for you. If it can do only one thing (hold pens and scissors), at least make it be decorative, too. Get, or make, a trash can with dips around the top rim large enough to stuff your trash through. Then use a board (nicely painted or covered in fabric or shelf liner) to make a small table top for phone chargers, coffee cups or a small potted plant. You could even use a short bookcase for a night stand. If you’re crafty, you can make a lot of your storage devices yourself using raw materials or things you find at garage sales. To give it a little extra flair, you can purchase fabrics, decals and the always-on-trend washi tapes to create artful accents within the room. Have an ugly lamp? Wrap it in washi tape. Got a large blank spot on the wall not covered with your jewelry and hats? Cover it with cork board to create a nice bulletin board or add snazzy decals. Whether you come to your dorm with too much stuff or accumulate a lot during the school year, you’ll need to take it all with you when the year’s over. What do you do with it all? You’ll need it all again in a few short months, so you need to keep what you use. But why haul it back home and try to stuff it into a corner of the garage? Call Zippy Shell and arrange for short term storage. We’ll provide you with packing supplies and instructions. Once you’re packed, we’ll come pick up your things at your door, store it safely while you’re away, then deliver it to your next dorm room or apartment. It may be the easiest thing you do all year. And right now, if you contact us and mention this blog post, we’ll take $20 off your monthly storage. Check out Zippy U for more details today.